It’s riding season! Happy Fan Friday to all. 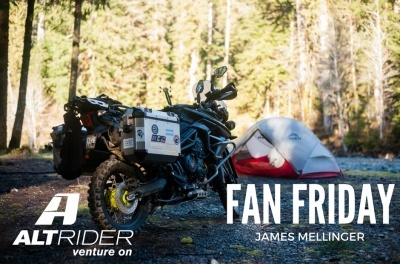 This week we sat down with good AltRider friend and fellow Seattle resident James Mellinger, 26. Originally from the suburbs of Chicago, James spent his college years in the city while attending Columbia College of Chicago for Photography. After graduating in 2015 he moved out to Seattle and has been loving it ever since. James works at Triumph of Seattle, right down the street from AltRider HQ. A bit of a jack of all trades, he splits his time photographing new products and bikes as well as helping customers build their dream bikes and getting set up with the right gear. A rider since before he can remember, James started racing motocross when he was 4 years old, and 22 years later is still at it. “I have the aches and pains to prove it, but it’s a thing I will never give up,” James said. He’s ridden almost every displacement KTM in the SX line, and currently owns a 2015 KTM 250 SX as well as a Triumph Tiger 800 XC, which he just got after trade in from a Bonneville T100. James has been slowly accumulating AltRider parts for the Tiger. He started with AltRider’s Luggage Rack, followed by AltRider Crash Bars. 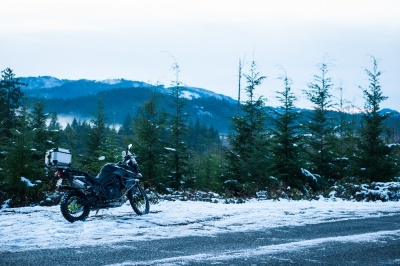 “First was AltRider’s luggage rack that offers so many more mounting points and just the sheer amount of surface area made it an easy decision. Next came AltRider’s phenomenal crash bars. I've tested them rather well and they have never failed me. When you have a 28" inseam on a regular height Tiger and ride it off the beaten path you're bound to drop it. Or you know, you are too tired in the morning and drop it pulling out of your parking spot. That too. Once I hit 6,000 miles and need to do my first minor service I'll swap out my bent and beaten stock skid plate for the AltRider Skid Plate. And I really should pick up AltRider’s Headlight Guard because you can't order the headlight lens separately and they are not cheap. And Heel Guard, Dual Control Brake System, Hemisphere Tank Bag... the list goes on. By far my favorite AltRider product has been the crash bars. Smashing your tank is one thing, but smashing your radiator is another. No one wants to blow up their bike." With his experience, there’s really not many places he doesn’t love riding. So far getting the Tiger lost in the Olympics on dirt roads and random offshoots is one of his favorite activities. He also enjoys taking his dirtbike to Motoland, a motocross track in northern Indiana. “The track is all sand. It’s built on an old military armory where they built and tested grenades. The track is so long that they actually split it in half most of the year and run both tracks at once. The back one is a little more flow-y while the front track is more technical with a huge step-up double followed by another step-up. I actually tore my ACL in that section by getting landed on and ran over... that was fun,” he said. We can’t wait to see the images when he does it. To everyone hopping on their bikes this weekend, stay safe and enjoy the ride.